Welcome to another #TwoBlogsFunGuides event! 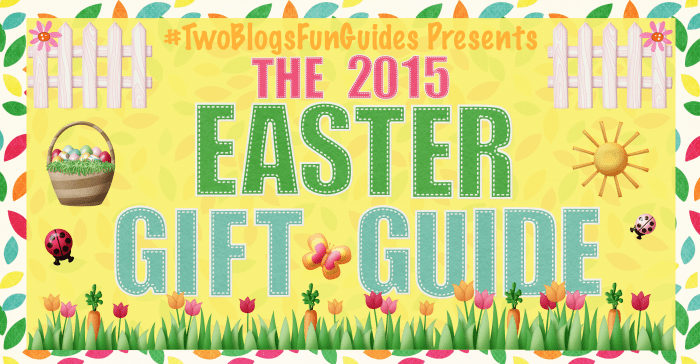 We are presenting the 2015 Easter Gift Guide for all of your shopping needs. We have a little bit of everything on this guide for your loved ones. Maybe you usually only shop for the kids, but you want to switch it up this year. We have some great gift ideas here that you may not have thought of yet. Each gift on this guide was personally tested and approved by one of the two bloggers: Women and Their Pretties or Mama Smith’s Blog. Please enjoy and remember to keep coming back because new items are added daily! Follow Tessa’s board Easter Gift Guide on Pinterest. Bunny Peek-A-Boo comes with sturdy wooden blocks and challenge cards to exercise your little ones’ brains. The cards range in difficulty and children as young as 2 can play with Bunny Peek A Boo. It is a fantastic and fun introduction to concepts such as above/below, inside/outside, visible /hidden, etc and has won several children’s awars. Playfoam from Educational Insights is a great creative tool for little ones! It comes in separate colors that can be kept alone or mixed together. The special no stick formula means less mess for mommy and daddy to clean up when play time is over. Playfoam would make a great addition to any little one’s Easter basket this year because it promotes learning and creativity. With Playfoam, the possibilities are endless! These are great for your kids to me creative and put on a show with the puppets. It’s also a way for them to express themselves. I would imagine that any little one would be THRILLED to see one of these in their Easter basket on Easter morning! These are a great addition to an Easter basket. They are a great idea and perfect for a toddler’s or kid’s Easter basket! Boys and girls will both have fun with the bubble chicks. Make these a part of your gift giving this Easter or bring them to the Easter fun! What would be more perfect than watching the kids hunt Easter eggs and blow bubbles on Easter Sunday? CVS has everything that you need this Easter holiday – from stuffed animals, to candy, to Easter grass – even Easter baskets! They also have egg dying kits and plastic eggs to help you make your pre-Easter activities fun as well! CVS really is your one-stop-shop when it comes to getting ready for the holidays. This year add a Magic Moves Rainbow Jam from Educational Insights to your child(ren)’s Easter basket. It comes with a book that plays songs when in instrument mode which is a lot of fun. But guess what? You can change it to Song Mode and then touch anything around you to play a fun song about it’s color! Help your child learn their colors and have fun doing so! Easter time usually means that the snow is finally melting and kids can get outside and play. So why not include Dirt Diggers from Little Tikes in their Easter baskets this year? These durable plastic trucks are perfect for digging dirt, hauling toys, and loads of fun! This book is the perfect addition to any little one’s basket this Easter. Read all about the curious bunny and his first Spring. Any child is sure to love his adventures. Spot It! 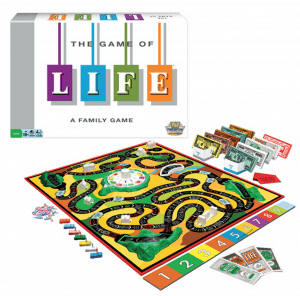 games are perfect gifts for children. They are small enough to fit into Easter baskets, stockings, and gift bags. You can even travel with them! They are a fun way for your children to learn! Children of America dolls are great for any young girl. They each come with their own background and story as well as an extra outfit and hair clips. These dolls will make best friends for any little girls and would be the perfect centerpiece to any basket this year. The Disney Frozen Easter Basket is so adorable and will make any little girl’s Easter a dream come true. Everything from the basket to the goodies inside are Frozen themed.I don’t know any little girl that wouldn’t go crazy over a basket like this! If you are looking for other Disney themed baskets, Toys R Us has TMNT, SpongeBob, Cars The Movie, Cinderella, Minnie, and Sofia The First themed Easter Baskets. Hoppy Floppy’s Happy Hunt from Educational Insights is a fun family game that would make the perfect Easter gift this year. Spin and try to be the first to collect all four colors of carrots – purple, pink, orange, & yellow. This game helps kids with color recognition as well as dexterity. Start a new tradition this year with The Magical Tale of Easter Bunny Dust. This book comes with a pouch of your very own Easter Bunny Dust to sprinkle the ground around your home with. This way you know that the Easter Bunny will make it to your home this year! Target Grocery has all the candy you need to fill your child(ren)’s Easter basket this year! Whether their sweet tooth is for chocolate, gummies, or both, they have you covered! From edible Easter grass for the baskets, to giant gummy bunnies, to mini bark filled with jelly beans – get it all at Target Grocery! What better gift to give this Easter than something heartfelt and personalized? I See Me! offers many different gifts such as books, placemats, and growth charts. Children are sure to love reading about themselves in stories. Give a gift that will be cherished for a lifetime with I See Me! Enter code SPRING for free shipping! Read Our Reviews: Personalized Books for Easter from I See Me! CLIF Kid Snacks will make a great addition to children’s Easter Baskets this year. The Zbar & Zfruit are made from organic ingredients making them a much healthier alternative so sugary treats and snacks. Kids love the tangy fruit ropes and the delicious chocolate chip bars – making this a win/win for parents and kids alike! I love the Catch Spring Fever with SinfulColors 2015 Polish! The colors are favorable and beautiful for everyone. They are a great deal for only $2.00 and would be the perfect addition to a teen’s Easter basket this year! This water-resistant watch features new sensors to deliver higher reading accuracy and improved energy efficiency, as well as one-press access to a digital compass, barometric pressure and altitude, and temperature reading at your fingertips! Everything about these models is designed and engineered to make them essential pieces of outdoor gear. Read Our Reviews: Gift a Casio Pro Trek Watch this Easter! Players randomly slot ten cards on their rack. The race then begins to draw and discard until one player positions ten cards in numerical sequence. Sound simple? It is but you will need skillful play, concentration and just a little luck to win. This is a great game for teens, college kids, or adults! If you want to make a boys day this Easter, pick up some of these lights. I promise he will not be disappointed. They actually have a ton of different characters to choose from, other than the Avengers collections, so you can buy for any age or gender! Available in coordinating colors and flavors, the sneakers shine bright in pastel Lavender (Passion Fruit), Blue (Blueberry Acai), and Red (Pomegranate Raspberry). They launch in Shoe Carnival on March 15th, and will retail for $50/$55, ip balm included! Since Carmex has the new, fun designs I think it would be a cute addition to an Easter basket for teenage girls! They can protect their lips with style! Sashka Co’s colors and designs are so addictive. Once you own one of their bracelets, you will want them all! They really have something for every occasion. With that being said, I recommend some of the bright pink and pretty blue bracelets for teenager’s Easter Baskets this year. I don’t know a teenage girl in the world that wouldn’t love a bracelet this beautiful and fashionable. Community Coffee is a great addition to any Teen’s Easter basket. It is delicious, smooth, and comes in single-serve, whole bean, and ground varieties – and even tea. This year give your teen something they are sure to love – Community Coffee! 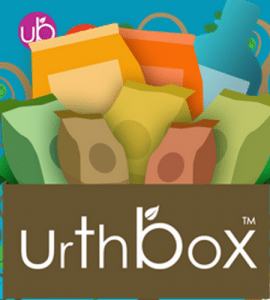 The Urthbox is a monthly subscription service that send a box of full-size healthy snacks directly to your door. With subscription options between $9 and $49 a month, you can expect a great deal for your money! They will send you a wide variety of drinks, snacks, and the occassional eco-friendly beauty and hygiene products. The snacks range from seeds and nuts to dried meats and snack bars. Get the Large (Group Snacker) for families or for the office for Easter! Purell Jelly Wraps make a great addition to any Easter basket. This is the perfect gift for any family member and will keep away the nasty germs this season! Purell sanitizer kills 99.99% of germs that cause disease and now come in new Spring scents and colors. Clip a jelly wrap to your purse or your child’s backpack and you are all set! Nature Nate’s honey and syrups are all raw & unfiltered. What does that mean? It means that in order to ensure quality and to prevent crystallization, Nature Nate’s 100% Pure, Raw and Unfiltered Honey is gently warmed to temperatures around 120 degrees rather than 180 degrees. Rooted in Verona, Italy, all Bauli products are baked in a REAL oven to ensure superior taste and quality. Made with love and naturally leavened dough, the individually wrapped croissants are available in three delicious flavor fillings – Cherry Jelly, Chocolate Flavor, and Vanilla Custard. Bauli also offers mini croissants that are automatically portion controlled at just 50 calories a pop. Level Life Sweet Snacks have less sugar than the leading candy bar and are gluten free! The peanut butter cup and peanut turtle bar are perfect for treating yourself while still supporting healthy blood sugar. These treats taste great – and are a healthier alternative when filling up your baskets this year! This Easter, celebrate with Mocktails Brand. These drink mixes come in fun shakers that make it easy to customize drinks just the way your guests like them! No more spending time away from entertaining while getting drinks just right. Just add ice, amount of alcohol preferred (or no alcohol! ), shake, and serve! Your guests will love Mocktails Brand! Entertaining this Easter? Use Duck Brand Duck Tape to create fun DIY decorations such as an egg wreath, Easter Cone, and Spring Party Masks! Duck Tape comes in hundreds of Easter-inspired looks to choose from like Rubber Duckies, Gummy Bears, and Baby Pink. Ducklings Mini Rolls are also a great size for Easter baskets and come in a variety of prints and colors, including Candy Dots and Pink. Target Grocery has many adorable Easter items this year. One thing that is sure to be a hit with the whole family is the Little Lambs Cupcake kit! This kit comes with everything that you need to make a super cute flock of sheep cupcakes. Impress your guests – and have fun with the kiddos while making them! Pepperidge Farm has lots of yummy snacks like Milano Cookies and Goldfish. Do you want to know how to turn these in to delicious and creative Easter themed snacks? Well, look no further, read this review and you are sure to impress at your Easter get together this year! CVS has everything that you need this Easter holiday so be sure to swing in to one near you and stock up on family fun! Don’t forget to dye eggs with your kids and hide eggs for the Easter egg hunt! Grab what you need to make your Easter holiday perfect at CVS. Fruttata Crisps are freeze dried fruit chips. They are all natural with no sugar added. These gluten free snacks are a perfect snack to add to your diet. They are perfect for snacking on fruit at work or on-the-go. The Rudolph’s snacks are great for an Easter basket for families or adults. The 3.0 oz bags are enough for the entire family to share. Mrs. Freshley’s has several delicious snacks that every glutton will enjoy. They have a little bit of everything, so you are bound to find something that everyone in the family will love. They have teamed with Cinnabon for some of their most delicious snacks. I recommend the Rickland Orchards Greek Snacks for Easter Baskets this year. I think that they are a great new alternative to your typical Easter candy this year. They are great for the entire family to snack on, but I promise that you will not want to share with anyone! I recommend the SunRidge Farms snacks for all families. They are organic, healthy, and just as important-delicious. They are great on the go snacks because they have a resealable zipper, so you can eat some now and some later. Add these to the Easter baskets this year and you will have a happy family! I think that Guylian chocolate are delicious and a must-have sweet treat to keep in your home.You can’t go wrong with belgian chocolate, especially the Guylian Belgian Chocolate. Put these in the gift baskets for easter this year and give your family an Easter to remember! Since it is so easy to make, it is great for kids to make with you! They will love being your kitchen helper. This is also great for parties, get togethers, and holidays because of how quick and easy it is to make and bake! I recommend Barista Baking Company scones to anyone looking for a quick and easy dessert or breakfast idea! I love to enjoy mine with a nice cup of warm coffee! Why not add these to your Easter routine? Alter Eco truffles are not only delicious, they are environmentally responsible and socially just. These yummy treats are organic, fair trade, and made from the highest quality ingredients! The wrappers are compostable and the packaging is recyclable! All Alter Eco products are USDA Certified Organic, Fair Trade Certified, Carbon Neutral Certified, Non-GMO Project Verified and Certified Gluten-Free. Morphology is so much fun! It is unique, creative, and a great way to use your imagination without even realizing it. Creativity is KEY in Morphology. The most creative wins. Morphology is definitely a family game and would be a really fun game when you are spending the holidays together. If you have someone in your life that prefers no show socks – grab them some Bamboo No Show socks from Little Bamboo. These socks are ridiculously comfortable – they are super soft on your feet! The bamboo fibers are great because they make the socks anti-odor and anti-bacterial. They have non-slip silicone grips around the heels which prevents them from slipping off while walking. These are great for tennis shoes, boat shoes, loafers, dress shoes – you name it! Since Easter is only a few days away, I want to give you a few ideas to make it a Hallmark Easter. Did you know that Hallmark has Easter cards for just about everyone? What better way to express yourself than with a greeting card? The fact is that sometimes you can’t physically be with your loved ones. That doesn’t mean you can’t surprise them with a nice card letting them know that you are thinking about them. Everything you adored about the original 1960 game will be found inside. Good fortune is always around the corner. Bring back the nostalgia of the classic game, with the classic rules!